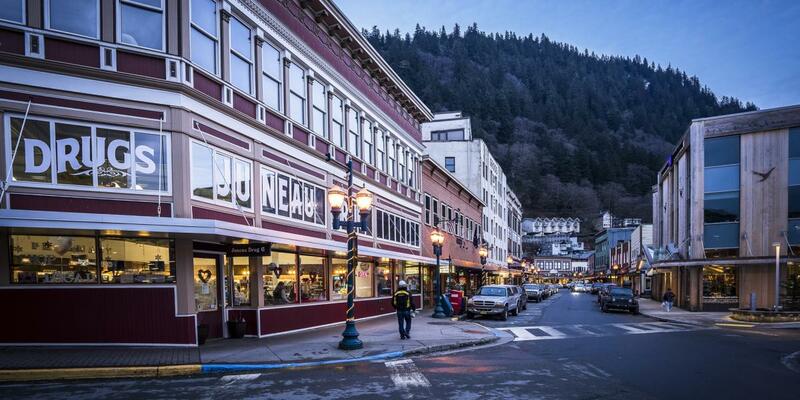 Is exploring downtown Juneau landmarks and historical sites how you want to spend your day? Grab a downtown Juneau map at any of the four welcome centers located around town, or download here. Watch for the blue three-sided historic signposts throughout the downtown area that describe the highlights of the immediate area and add a little more interest to your walking tour. Juneau's waterfront is a beehive of activity during the summer. Look for a sidewalk sundial and a memorial dedicated to fishermen lost at sea near the tram terminal. On the dock adjacent to Marine Park Plaza are pictures of Southeast's lighthouses, a Juneau distance map made of nails hammered into the decking, and a tidewater gauge is near the floating dock. Use the spotting scopes to find mountain goats on Mt. Juneau. Start on South Franklin. Some of Juneau's oldest establishments are bars - remnants of the early gold mining era. The town sported 30 saloons around 1914. The Alaskan Hotel & Bar, 167 South Franklin, is listed on the National Register of Historic Sites and is filled with ornate Victorian-era furnishings. The bar is a favorite with locals on "open mic" night. Find the Red Dog Saloon at 278 South Franklin, where you'll see Wyatt Earp's gun from Nome, lots of stuffed critters, and interesting Alaska memorabilia. The Filipino Hall at 251 South Franklin was built in 1891, then the site of Anna Goldstein's Merchandise Store. The restored Senate Building at 175 South Franklin retains much of its former elegance and houses a variety of shops. The Alaska Steam Laundry, now the Emporium Mall at 174 South Franklin, was the center of Juneau's business district. Built in 1901 (the business dated from 1895), the building has a wood-shingled turret and ornate slanted and shingled front parapet. Historical photos are inside. The historic Elks Hall at 109 South Franklin was the first Territorial Capitol in Alaska. Gunakadeit Park, named for a legendary Tlingit sea creature, is across the street from the Downtown Clock on the corner of Front and Franklin streets. Front Street was the water's edge at high tide before the Alaska-Juneau mine tailings became the foundations of the streets closer to today's waterfront. Juneau's first bar, the Missouri (built in 1891 and later renamed the Louvre), is now the Imperial Bar at 241 Front. The pressed tin ceiling and walls behind the bar date from 1906. Also on Front Street were Jorgenson's Hardware and the 1896 Lewis Building at 130 Front Street. Now McDonald's, the building housed a bank until 1925. Head uphill on Seward to see some of Juneau's prominent historic sites. In 1913, jeweler and businessman Emery Valentine built the Valentine Building, which now houses the Juneau Drug Company, at 119 Seward. He organized the Volunteer Fire Department and served six terms as mayor. In 1914 the Goldstein Building, 130 Seward, featured a department store. It also served as Alaska's Capitol three times. Keybank at 234 Seward is across the street from the original 1896 bank. At the corner of Seward and Third, turn left on Third and walk uphill on Main Street to see local artist Skip Wallen's "Windfall Fisherman," a life-sized bronze brown bear. The Alaska Capitol, on Fourth between Main and Seward, was completed in 1931. Alaska's political powers pass laws here from January through May, but it has free self-guided tours during the summer. Although it has no dome, this working Capitol has marble columns, a reproduction of the Liberty Bell, and historical photographs and paintings. Across Main is the State Office Building (locals call it the SOB). Check out the 8th floor for a spectacular view of Juneau and free pipe organ concerts on Fridays. Follow Fourth Street, which becomes historic Calhoun Avenue, about two blocks to the Governor's House, a "liberal interpretation of New England colonial" architecture built in 1912 for $40,000. Gov. Bill Walker, along with wife, Donna, is the 11th to live in the house since statehood in 1959. Prior to that, nine territorial governors and one secretary of Alaska resided in the house. Over the years, Charles Lindbergh, Warren Harding, Herbert Hoover, and Gerald Ford entered its halls. George Eastman of Kodak and Sir Thomas Lipton of yachting and tea fame have been guests. The 14,400-square-foot building has 35 rooms, not including the garage or closets, 10 bathrooms, and six bedrooms. The house boasts eight fireplaces. The second floor serves as the family's personal quarters. The totem pole outside, commissioned in 1939 by the Civilian Conservation Corps, tells the story of the mosquito's origin. Backtrack on Calhoun, take the overhead walkway and trek down Fifth Street a little more than two blocks to the next stop. St. Nicholas Russian Orthodox Church at 326 Fifth Street, with its gold onion dome, is a reminder of the Russian presence in 19th-century Alaska. Built in 1894 by newly baptized Orthodox Natives and Siberian gold miners, the church has been refurbished and is a national historic landmark. The octagon-shaped structure houses 18th-century Russian icons and religious relics. It is included in "A Guidebook to the 500 Most Notable Buildings in the United States." Visitors stand during services. The church has a small bookstore and gift shop with postcards. Across Gold Street on Fifth Street is the Cathedral of the Nativity of the Blessed Virgin Mary, home to the Catholic Diocese of Juneau. High up in Juneau's hills at 213 Seventh Street is the House of Wickersham. The home remains much as it was when Alaska pioneer Judge James Wickersham purchased it in 1928. It was the first large Victorian home built on "Chicken Ridge," the "Nob Hill" of Juneau. If you're up for a hike, head back to the Governor's House, wind down Calhoun across Gold Creek at Cope Park. Veer left (Calhoun becomes Irwin toward the right). Take the entrance to Evergreen Cemetery, where Juneau founders Joe Juneau, Richard Harris, and Tlingit Chief Kowee are buried. Proceed through Evergreen Cemetery to Glacier Avenue. Turn left on Glacier Avenue to the Federal Building, which houses the post office, Native art and history exhibits, and the Juneau time capsule. Glacier becomes Willoughby Avenue. Cross Gold Creek and continue until Whittier. Turn right to the Alaska State Library, Archives and Museum, affectionately known as the SLAM, then continue to Centennial Hall. Nearby Centennial Hall Convention Center hosts conventions, meetings, exhibits, and community events.